Mesenchymal neoplasms of the gallbladder are rare and in particular leiomyomas of the gallbladder have been rarely reported, all of them in patients with immune system disorders. This is the first report in Spanish of a 23-year-old female patient with a gallbladder leiomyoma without associated immunodeficiency. The patient lacks a previous history of uterine leiomyoma or any other form of neoplasm. She refers several episodes of epygastralgia. A hydatic cyst led to an initial diagnosis and the gallbladder was removed by means of simple cholecystectomy. The abnormal macroscopic aspect of the sample prompted intraoperative biopsy which revealed a benign gallbladder angiomyoma. Subsequent immunohistochemical analysis of the resected sample yielded the diagnosis of intramural endocavitary leiomyoma negative for EBV and C-kit / CD-117. The patient has good general condition and remains asymptomatic 15 months after surgery. Key words: Leiomyoma. Gallbladder. Mesenchymal neoplasm. Cholecystectomy. Las neoplasias mesenquimales de vesícula biliar son una patología muy poco frecuente, concretamente, son muy pocos los casos descritos de leiomioma de vesícula biliar y todos ellos diagnosticados en pacientes con enfermedades del sistema inmunitario. Se describe por primera vez en la literatura en lengua española el caso de un leiomioma vesicular en una mujer de 23 años sin compromiso inmunitario alguno. La paciente carece de historia de leiomioma uterino o cualquier otra neoplasia. Presenta una historia de epigastralgias de evolución. Se formuló un primer diagnóstico guiado por imagen de quiste hidatídico. La vesícula fue extirpada mediante colecistectomía simple. El aspecto macroscópico anormal motivó una biopsia intraoperatoria que fue informada como angiomioma vesicular benigno. El posterior estudio inmunohistoquímico de la pieza arrojó el diagnóstico de leiomioma intramural y endocavitario negativo para VEB y C-Kit / CD-117. La paciente presenta buen estado general y permanece asintomática 15 meses después de la cirugía. Palabras clave: Leiomioma. Vesícula biliar. Neoplasias mesenquimales. Colecistectomía. A 23-year-old female patient who refers several episodes of epygastralgia of 4 or 5 months of evolution not related to food intake which improved after vomiting. In the personal history of the patient, we remark the use of oral contraceptives for a period of 3 years. Blood test shows leukocyte count of 3,570 x 109/L, Hb 115 g/L and MCV of 78 fL. The rest of parameters showed normal values. The patient remains asymptomatic between the episodes and keeps normal bowel habits. Simple abdominal X-rays reveal heterogeneous calcifications of 4-5 cm in the hepatic flexure of the colon. 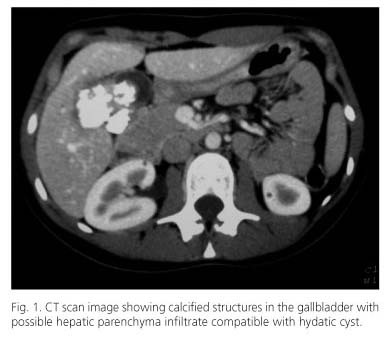 Abdominal echography shows the formation of biliary mud and a heterogeneous, hyperechoic mass of 45 mm adjacent to the gallbladder compatible with a diagnosis of hydatic cyst. Although the patient cohabits with dogs in an endemic area of hydatosis as is Spain (1,2), and the initial diagnosis leads to such condition, serology for hydatosis is negative. Abdominal CT scan (Fig. 1) shows hepatomegaly and partially calcified SOL (Space Ocuppying Lesion) of 50 mm in segment 5 of rounded morphology, lobulated borders and smaller rounded masses in the periphery. The image is compatible with a hydatic cyst but we do not discard a differential diagnosis with partially calcified hemangioma. The gallbladder presents with several microlithiasis without signs of inflammation. The CT scan also reveals a hemangioma of 31 mm in segment 4 as well as cortical cysts in both kidneys. The patient undergoes cholecystectomy and cystopericystectomy for suspected hydatic cyst and cholelithiasis. A right subcostal laparatomy is carried out. The gallbladder presents with an intravesicular tumor of petreous consistency which does not infiltrate the hepatic parenchyma (Fig. 2), and shows no SOL in segment 5. Intraoperative biopsy of the mass yields a diagnosis of benign gallbladder angiomyoma recommending simple cholecystectomy to remove the mass. The postoperative was satisfactory without complications. Subsequent anatomopathologic study describes a solid mass of elastic consistency and expansive growth which does not affect mucosa and serosa. The sample is negative for EBV and C-Kit / CD-117 (Fig. 3). At present, the patient remains asymptomatic and abdominal echography shows no recidive or any other alterations after 15 months. Leiomyomas are benign tumors of smooth muscle mostly affecting the female genital tract (95%). Nevertheless, they may be found in any anatomic site with smooth muscle tissue. Whenever leiomyomas occur as an isolated lesion, the prognosis is excellent, especially if complete exeresis of the tumor is achieved (3). So far, only a single case of isolated gallbladder leiomyoma has been described in the medical literature in English language in a series of patients previously studied as a result of benign gallbladder neoplasms (4,5) and we have found only three cases of systemic leiomyomatosis within the context of Epstein Barr virus infection -associated to HIV infection (6), severe combined immunodeficiency (7), Wiskott-Aldrich syndrome (8)- affecting the gallbladder. In these cases, gallbladder involvement was multifocal and other organs were also affected. In the case we describe, only the gallbladder is involved in a multifocal way. As regards the previous intake of oral contraceptives, a WHO study has concluded that there is no relationship between the use of oral contraceptives and the development of gallbladder cancer (9). The prevalence of benign mesenchymal tumors of the gallbladder is still unknown. Among the histological types of benign gallbladder tumors so far described we find paragangliomas, neurofibromas, polyps, GIST (gastrointestinal stromal tumor) and other lesions, all of them rare (10). The estimated prevalence of gallbladder sarcoma is around 2% (11). The differential diagnosis of gallbladder leiomyoma includes leiomyosarcoma, extra-gastrointestinal stromal tumor and other mesenchymal tumors (12-15). A biopsy of the affected tissue is necessary (usually following cholecystectomy) to establish a definite diagnosis and rule out the possibility of leiomyosarcoma and other type of sarcomas. The strong immunoexpression of smooth muscle cell actin and the lack of CD-117 immunoexpression confirm the leiomyomatous nature of the lesion instead of extrahepatic bile duct GIST. Smooth muscle tumors associated with EBV are another pathologic entity that should be discarded in the differential diagnosis of smooth muscle tumors of the gallbladder. Unlike the case here reported, these tumors are related to immunodeficiency, are multifocal and affect several organs. Therefore, leiomyomas should be considered in the differential diagnosis of gallbladder tumors not only in the case of immunosuppressed patients but also in patients with preserved immune system function. 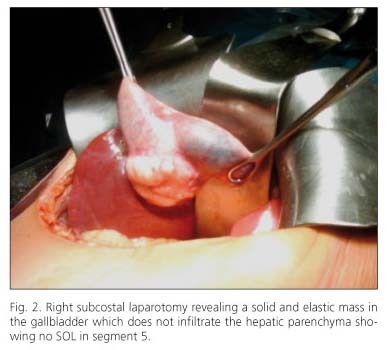 In the case of leiomyomas of the gallbladder, laparoscopic cholecystectomy should be an effective treatment and is the treatment of choice once the histological confirmation has been obtained (16).